Those of you who are regular readers of my blog or regular listeners of my podcast know that I used to be a member of the Church of Jesus Christ of Latter-Day Saints, colloquially known as the Mormons, and I served a full-time two year mission for the church at my own expense. Well, OK, to be honest it wasn't all at my expense because a family that I was friends with helped to pay for my mission, but the Church did not support me and, except for rare situations, does not support any missionary. Missionaries of their families are expected to cover the entire expense of the mission for the duration of the mission, though I imagine that if a missionaries parents stopped supporting their son or daughter while on a mission the Church would not let him or her starve. I served my mission in the Hawaii Honolulu mission, and before you ask, no, it was not a vacation! I was there for a little over two years and I saw the beach every single day, but as I was not allowed on the beach, I never stepped foot on the beach, not even once. Seeing the beach every day but not being able to go on the beach was a form of torture. I might not have liked all of the rules, but I followed them all the same. The first day in Hawaii all of the missionaries were given the strict, mission specific, rules, one of which was that we were never to go on the beach and that if we were ever caught on the beach we would be on the next flight home, no questions asked. It was also stressed that getting sent home for breaking rules would be considered a dishonorable departure from the mission and would bring shame to the missionary being sent home and to his or her family. My mission president said, "there is nothing wrong with the sand or the water, it is what is on the sand and in the water," and by that he meant barely clothed beautiful people. Besides the rules, it was stressed to all of the missionaries that they were to make sure people understood and believed the Church's claim that the early Christian church fell into total apostasy because if there was no apostasy there was no need for a restoration and therefore no need for Joseph Smith, and the church Smith started would be false and all of his claims would have to be lies. Well, it's either true or false. If it's false, we're engaged in a great fraud. That's our claim [Joseph Smith actually seeing God]. That's where we stand, and that's where we fall, if we fall. President Gordon B. Hinkley said in an interview with PBS, "Well, it's either true or false. If it's false, we're engaged in a great fraud. If it's true, it's the most important thing in the world. Now, that's the whole picture. It is either right or wrong, true or false, fraudulent or true. And that's exactly where we stand, with a conviction in our hearts that it is true: that Joseph went into the [Sacred] Grove; that he saw the Father and the Son; that he talked with them; that Moroni came; that the Book of Mormon was translated from the plates; that the priesthood was restored by those who held it anciently. That's our claim. That's where we stand, and that's where we fall, if we fall. But we don't. We just stand secure in that faith." When some members of the Church start to doubt and realize they no longer believe in some aspects of the Church, such as the continuing line of prophets, they reason that the rest of the Church is true and stay, but Hinkley’s statement leaves no room for debate on the subject; either all of the church is true or none of it is. It all hinges on the validity of Joseph Smith's claim to have seen God, so if that is a lie, or if it is not completely and literally true, than the Church is a fraud. The entire structure and authority of the Church is not only dependent on proving that the early Church completely fell away but is also dependent on proving the early Church looked like today's LDS Church. Even if the early church did fall away into complete and universal apostasy, which it didn't, the LDS Church would still have to prove that the church as it is today and the doctrine they espouse is exactly as it was when Jesus was on the earth, but that simply is not the case and therefore can't be proved. Jesus was satisfied with the answer and said, “Blessed are you, Simon son of Jonah, for this was not revealed to you by flesh and blood, but by my Father in heaven. And I tell you that you are Peter, (which is Greek for rock) and on this rock I will build my church, and the gates of Hades will not overcome it. I will give you the keys of the kingdom of heaven; whatever you bind on earth will be bound in heaven, and whatever you loose on earth will be loosed in heaven” (Matthew 16: 13-19). If the church that Jesus founded fell away to total apostasy than that would mean that Jesus either lied or did not know what he was talking about, and neither of those options are good as they would mean that Jesus was not much of a God. The more logical response to the passage is that Jesus meant what he said, knew exactly what he was talking about and that the gates of hell did not prevail against the church and it did not fall away. One of the big things the LDS Church claims is that since the church fell away all priesthood authority was taken from the earth and since it was restored by Joseph Smith that they are the only ones that have it. The LDS Church claims to hold two priesthoods, which they say are the power and authority to act in the name of God, one is the Aaronic Priesthood and the other is the Melchisadec Priesthood. A careful reading of the Bible will reveal that the LDS Church does not have a clear understanding of what the priesthood is or what it was used for. The Aaronic priesthood, which was only through the literal blood line of Aaron (Exodus 28:1; Numbers 16:40, 18:7; Hebrews 7:5), was for the offering of sacrifices to God on behalf of the people. A man was ordained as a priest, not by the laying on of hands as the LDS Church does, but by the anointing the man with oil and than with the blood of a sacrificial animal, typically a ram, and the process lasted seven days. The position of high priest was a lifelong calling and there was only one high priest at any given time, or at least that is the way it was done until Israel was under Roman rule and then the roman tribute or client king could appoint as many high priests as they saw fit and Herod the Great appointed at least six high priest during his reign. The high priest’s most important job was to, once a year on the day of atonement, go into the holy of hollies and offer sacrifice on behalf of the entire nation and all the Jewish people, but first he had to offer a sacrifice for his own sins before he could offer a sacrifice for others. The whole purpose of the priesthood was to have men stand as intercessors between the people and God, but once Jesus came and gave himself a sacrifice we no longer needed a man to stand between us and God as Jesus became our advocate with the father. The LDS Church claims that the Melchisadec Priesthood was originally called the Holy Priesthood after the order of the Son of God and was changed to Melchisadec as to not use the name of the lord too often, but the Bible tells us that Jesus was a priest after the order of Melchisadec, not the other way around, (Hebrews 7:17). When Jesus came he was not only the perfect sacrifice but also the perfect high priest. Since Jesus had no sin he did not have to offer a sacrifice to cover his sins before he could offer a sacrifice for the sins of the people, and his sacrifice was an eternal sacrifice where the other sacrifices had to be performed yearly. It is also of note that when Jesus sent the Apostles and disciples out to spread his gospel, the King James Version uses the term they were “ordained” as if to grant special authority (many are in Acts, Titus, and 1 & 2 Timothy). However, the Greek text does not support this translation. The LDS Church says they believe the Bible so long as it is translated correctly, well, the more correct translations more accurately translate this and use the word "appointed" or "called" (by way of election) in the New Testament. So the Mormon view of having some special authority by way of ordination is not in any way based on an accurate representation of the original Greek word used in the New Testament. For a church that claims to be interested only in the correct translation of the Bible they sure like to take mistranslated verses from the King James and base entire doctrine around it. One of the first subjects a Mormon will bring up in an encounter with a Christian is authority and priesthood. Mormonism teaches that the true church ‘was lost after the death of the apostles, and that, after 1800 years, the true church with “authority” was restored through Joseph Smith. Mormon: By what authority do you (or, your pastor) preach, baptize and, in gen­eral, act for God? Christian: By the authority of Jesus Christ through the power of the Holy Spirit (John 1:12—13; Acts 1:8). Mormon: But the authority to act for God comes through the Melchizedek priesthood. This was given to me by the laying on of hands by one who has this authority. Christian: Can you show me from the Bible where it states that the “authority” to preach the gospel, to baptize, and to offer the sacraments, comes from being a member of the Melchizedek priest­hood? In fact, can you show me in the New Testament where anyone but Jesus Christ ever held the Melchizedek priesthood? Mormon: In Hebrews 5:4 it tells us that no one takes this honor unto himself, but he that is called of God, as was Aaron. Christian: The very next verses tell us that God called Jesus, and no one else, to the honor of holding the Melchize­dek priesthood (Heb. 5:5-10). Once again I must ask: Where does the New Testament state that the apostles or anyone else but Jesus ever held the Melchizedek priesthood which Mormonism teaches is the au­thority to act for God? Mormon: John 15:16 tells us that Jesus laid hands on His disciples and ordained them. This is where He gave them the Melchizedek priesthood. Christian: The word “or­dain” means to appoint. The verse tells us that Jesus ap­pointed His disciples to go and bring forth fruit. John 15:16 does not even mention the Melchizedek priesthood, nor does it say that Jesus laid hands upon them. In the Book of Acts there are several Scriptures which make mention of the laying on of hands for the ordination to service, but none speak of an ordination to the Melchizedek priesthood. Mormon: By modern-day revelation we know that Peter, James and John came down from heaven and ordained Joseph Smith to the Melchize­dek priesthood, thereby once again restoring the church and the true authority to the earth. Christian: In order to be­stow the Melchizedek priest­hood, Peter, James and John would have to possess it. Where does the New Testa­ment state that they or anyone but Jesus ever held the Melchizedek priesthood? Mormon: We know this by modern-day revelation. And besides, the Bible does not state that the disciples did not hold the Melchizedek priest­hood. Christian: Please turn in your Bible to Hebrews 7:1-3. This passage tells us what the qualifications are for a Melchi­zedek priest. Let us determine whether you (or anyone in your church) meet these qual­ifications. The name Melchi­zedek means King of Righteousness. Who is the King of Righteousness? Many Bible scholars inter­pret this to mean that there was no record of who Melchi­zedek’s parents were, and he possessed no genealogy. There is no record of his birth or death. He was “made like unto the Son of God.” His priest­hood was continuing and everlasting. Do you know who your father and mother are? Do you know when you were born? Do you have a genealogy? Mormon: The answer is yes to all three of your questions. Christian: In addition, He­brews 7:26 gives further qual­ifications for a Melchizedek priest. “For such a high priest was fitting for us, who is holy, harmless, undefiled, separate from sinners, and made higher than the heavens;…” Are you holy, harmless, undefiled, sep­arate from sinners and made higher than the heavens? Christian: Therefore, you do not possess the Melchize­dek priesthood nor the auth­ority you presume to hold. However when you have be­lieved and received the gen­uine Jesus Christ of the Bible you will have the authority (John 1:12) and the correct priesthood (1 Pet 2:9—10) of the Scriptures. Mormon: You have given me something to think about. An act of restoring or the condition of being restored such as bringing back to a former position or condition or restoring to an unmarred and original condition. Something that is restored, especially a representation or reconstruction of the original form. 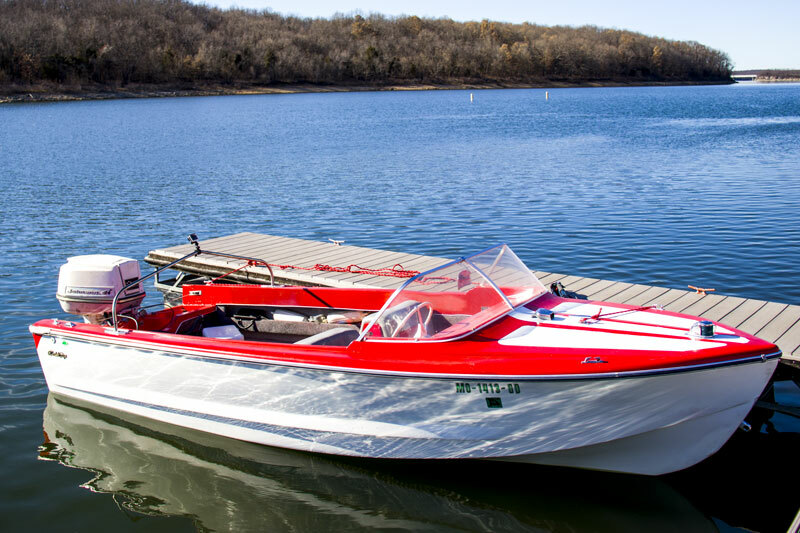 Until recently I was the proud owner of a 1965 Glasspar Goldcup 16' fiberglass runabout with the original 75 HP Johnson Super Seahorse outboard that was on it when it was new. I spent three years restoring the boat and, with the exception of the color, the boat was originally blue and I painted it red, I stayed true to the original when I did repairs. I replaced the rotten wood transom with new plywood and covered it in fiberglass, the same with the floor, I rebuilt the seats to the original specifications and then covered them with new marine grade vinyl and I replaced the rusted and frayed steering cables with new vinyl covered cables. I even polished up all of the original bright work and put it all back on after the boat was painted. Everyone always bragged on that boat when they saw it, mostly because it was a faithful restore. Imagine if instead of staying true to the original I got rid of the 75 HP outboard and retrofitted a 350 HP Mecruiser stern-drive, went with hydraulic steering, made the boat wider and longer, changed the profile of the bottom, etc. It may or may not have been a good boat when I was finished, and I may or may not have done a good job, but one thing would be certain, it would not be a restoration. To restore is to bring something back to its original condition, like it was when it was new. If after I spent all that time on the boat, if I took it out and excitedly showed it as a restored boat someone would put me in my place and tell me that it was not a restoration at all, and while it may make me angry and may even hurt my feelings, it would be the truth. The LDS Church claims many doctrines that are not to be found in the Bible and say that they are only missing because the Bible was corrupted over the years by religious leaders removing the things they didn't like and adding things that agreed with their world views, which would be no more true than if I said the boat originally looked like it did when I was finished but people had altered it over the years and removed things they didn’t like and added things they did. It would be easy to check and see that the original was nothing like I said and that my claim was false, and it is easy to see that the Bible was not altered to suit a person’s views. There is ample evidence, however, that the Bible has remained largely intact and unaltered all these years. There is a version of the Bible, however, that was written with the express intent to support one man’s doctrine and views, and that version is the Joseph Smith Inspired Translation of the Bible, which is not a translation at all. Smith read the King James version of the Bible and dictated his changes to his scribe, and there is not a Bible scholar on earth that would support the Joseph Smith translation as anything other than a fraud. A total of 48 complete verses in the KJV NT have been determined to be scribal additions. The JST fails to correct a single one. An additional 350 verses in the KJV NT have been determined to include scribal alterations and mistranslations. The JST again fails to correct a single one. Joseph Smith altered over 100 of the verses containing scribal additions, alterations, or mistranslations, indicating that he specifically reviewed many of the erroneous verses and failed to correct them. Perhaps most egregious are the JST's failure to omit the widely understood scribal additions of the story of the woman taken in adultery and the ending of the book of Mark. In fact, the JST adds to the story of the woman taken in adultery. The JST adds the word "Rabcha" to Matthew 5:22 which is a made up word. In three places, the JST changes the definition of "Golgotha" from "skull" to "burial" which is incorrect. The JST misses the KJV's "Calvary" mistranslation in Luke 23:33. The JST mistranslates "Cephus" to mean “seer." (Mormon Think). don’t resemble the Jewish or ancient temples in function, purpose, or in any other way. The LDS temple is in no way a restoration. One of the things the LDS Church claims is that their temples perform the same function as the Temple of Solomon did and that the reason there is masonic symbols and rituals in the temple is because the masons built the temple of Solomon and then later were corrupted as an organization. There is so much wrong with those claims that I don't even rightly know where to start, but I think the easiest claim to disprove is the claim that the Temple of Solomon resembled the LDS Temple today in purpose and rituals. As mentioned previously, the primary purpose of the priesthood was to be an intercessor between God and the people, and the priests would offer sacrifices to God in behalf of the people. The purpose of the temple was to have a place to offer sacrifices to God, (Jewish Virtual Library). Before the first temple was built people could offer sacrifices at any official alter, but the sacrifice for the entire people could only be offered at the tabernacle. When the temple was built it was the only place in which a sacrifice could be made and when it was destroyed by the Babylonians there were no sacrifices until the second temple was built. When the second temple was destroyed by the Romans following the Great Revolt there was no longer a place to offer sacrifices and the Jews still offer no sacrifices up to this day. (Qorbanot: Sacrifices and Offerings). There is simply no evidence whatsoever that the temple was ever used for baptism of the dead, initiatory, endowments, marriage, ever used any of the signs or tokes of the Masons or any of the other claims by the LDS Church. The priests were temporary intercessors between God and man and the temple was a temporary place to offer sacrifices, and the sacrifices themselves were temporary. When Jesus came he was our high priest forever, our intercessor between God and man, he replace the temple and was our eternal sacrifice. Ordinances and sacrifices are no longer needed and we no longer need any person to be our intercessor. Jesus said to destroy the temple and he would build it up in three days; Jesus is the temple and was referencing his three days in the grave before resurrection. As far as the temple of Solomon being built by the masons and the masonic rituals originating from the temple, that is also easy to disprove. According to the Masons themselves, Masonry started in the middle ages, and was never a religious organization and offers no saving doctrine or secret knowledge, (Masonic Service Association). The claim by the LDS Church that the Masonic order was around from Bible times, built the temple of Solomon and performed saving rituals inside of the temple are simply not supported and are disputed by the Masonic order itself. To summarize, the priesthood was meant to perform blood sacrifices for people and to be the ones who connected the people to God and once Jesus came there was no need for anyone to intercede for us and no need for sacrifices because Jesus was the perfect high priest, the perfect sacrifice and our advocate with the Father. The temple was never used for anything other than for sacrifice and was not built by the masons. The church that Jesus founded did not fall away and therefore there was no need for a restoration, and since the LDS Church looks nothing like the Church Jesus founded it could not be a restoration. The Bible is the word of God and it is important that we go to the Bible and spend time reading and understanding what it says and not get our doctrine from any books other than the Bible. The Bible warns us that there will be false Christs and false prophets and it warns us not to follow another gospel. Paul the Apostle said, “I am astonished that you are so quickly deserting the one who called you to live in the grace of Christ and are turning to a different gospel— which is really no gospel at all. Evidently some people are throwing you into confusion and are trying to pervert the gospel of Christ. But even if we or an angel from heaven should preach a gospel other than the one we preached to you, let them be under God’s curse! As we have already said, so now I say again: If anybody is preaching to you a gospel other than what you accepted, let them be under God’s curse!” (Galatians 1: 6-9). So Paul was saying that if anyone preaches a different gospel than what is contained in the Bible than they are under God’s curse, even if it is an angel from heaven, even if it is an angel named Moroni who appeared to a fourteen year old Joseph Smith. Paul was saying that even if he or the other apostles were to preach a different gospel that they would be accursed. Jesus himself said, “Watch out that no one deceives you. For many will come in my name, claiming, ‘I am the Messiah,’ and will deceive many, (Matthew 24: 4-5), and “if anyone says to you, ‘Look, here is the Messiah!’ or, ‘There he is!’ do not believe it. For false messiahs and false prophets will appear and perform great signs and wonders to deceive, if possible, even the elect. See, I have told you ahead of time,” (Matthew 24: 23-27). When Jesus comes it will be as apparent as lightning from the east to the wast in that everyone will see it and know it and there will be no dispute about it, so if anyone says that Jesus has come than they are lying or deceived, even if it is Joseph Smith saying that Jesus appeared to him in the woods or that he appeared to him in the KIrtland, Ohio LDS temple. Jesus warned us about false prophets, and Joseph Smith is the king of false prophets and has likely deceived more people than all other false prophets combined. The LDS Church also makes the claim that the Book of Mormon is a fulfillment of a prophecy in Ezekiel about the stick of Judah and the stick of Jospeh coming together, and while I could come up with a great argument as to why it is not what the Mormons say it is, but instead I will read a wonderful article from Jews for Judaism called “The Stick of Judah and the Stick of Joseph: Let’s find out!” by Gerald Sigal. And the word of the Lord came to me, saying: And you, son of man, take one stick, and write upon it: For Judah, and for the children of Israel his companions; then take another stick, and write upon it: For Joseph, the stick of Ephraim, and for all the house of Israel his companions; and join them one to another into one stick, that they may become one in your hand. When we call to mind the ancient custom in the making of books–that of writing on long strips of parchment and rolling the same on rods or sticks, the use of the word “stick” as equivalent to “book” in the passage becomes apparent. At the time of this utterance, the Israelites had divided into two nations known as the kingdom of Judah and that of Israel, or Ephraim. Plainly the separate records of Judah and Joseph are here referred to. Now, as we have seen, the Nephite nation comprised the descendants of Lehi who belonged to the tribe of Manasseh, of Ishmael who was an Ephraimite, and of Zoram, whose tribal relation is not definitely stated. The Nephites were then of the tribes of Joseph; and their record or “stick” is as truly represented by the Book of Mormon as is the “stick” of Judah by the Bible. Latter-day Saints claim that because of the division of the tribes of Israel into two kingdoms, God provided that separate records should be kept for each. They allege that this passage contains two provisions–firstly, that a stick or record was to be kept for Judah, and that a stick or record was to be kept for Joseph; secondly, that the two records were to be symbolically joined together into “one stick,” or record, that is, a scroll or a book, in the hands of the prophet. Having interpreted this passage to meet their theological needs they then ask: “Where is the fulfillment of this important commandment? Who claims to have the record of Joseph today?“3 The Latter-day Saints then answer their own questions based on their contrived interpretation of God’s message to Ezekiel. However, a study of the biblical text reveals that no mention is made of the joining of two records together. The Latter- day Saint rendering of “stick” to mean a “record,” “scroll,” or “book” is incorrect. Yet upon this incorrect understanding is based the Latter-day Saint claim that God commanded Ezekiel to take the stick (incorrectly rendered “scroll“) of Judah and then to take the stick (incorrectly rendered “scroll“) of Joseph and symbolically join them together to become one stick of scripture. That is, it is supposedly a prophecy that the Bible and the Book of Mormon are to someday be joined together as one book of scripture. There are several problems inherent in the Latter-day Saint interpretation. In ancient times a parchment scroll was written upon and then often attached to a length of wood around which it was rolled. Latter-day Saints interpret the phrase “take one stick and write upon it” to mean that a scroll is meant in this passage rather than that Ezekiel wrote directly on two pieces of wood. The Hebrew word ‘aytz (“tree,” “wood“), rendered “stick” in this passage, does not mean “scroll,” the Hebrew for which is megillah (for example, Jeremiah 36:27ff). The biblical phraseology the Latter-day Saints seek is expressed in the Hebrew Scriptures by megillat-sefer, “roll of a book” (Jeremiah 36:2), “a scroll,” that is, parchment skins sewn together and attached to wooden rollers. There is nothing in Ezekiel’s prophecy to indicate that “stick” refers to anything but one piece of wood on which the prophet was commanded to write “for Judah” and a second piece of wood on which he was to write “for Joseph.” The sticks were to be symbolic representations of the two kingdoms. The prophet is to take one of them in his right hand, concealing one end of it in his clenched fist. Then he is to take the other stick and join it to the first one, end to end. His clenched fist will grasp the place where the two sticks meet, giving the appearance that he is holding one long stick in the middle. Nothing in Ezekiel’s pronouncement nor anywhere else in the Hebrew Bible suggests that God commanded that two separate records be kept for both kingdoms. Even taking the Book of Mormon at its word, it is not a record of “Joseph, the stick of Ephraim, and for all the house of Israel his companions.” It is supposedly a record of the descendants of a family of the tribe of Manasseh who along with a number of other individuals allegedly left Jerusalem circa 600 B.C.E. and were supposedly divinely led to the Americas. In addition, it supposedly contains a record of the Jaredites, a non-Israelite people. On the other hand, the Hebrew Scriptures contain a chronicle of events, which encompasses the utterances of prophets sent respectively to the northern kingdom of Israel (of which Ephraim was the leading tribe) and to the southern kingdom of Judah. There is no gap in the biblical record. And when the children of your people shall speak to you, saying: Will you not tell us what you mean by these? say to them: Thus says the Lord God: Behold, I will take the stick of Joseph, which is in the hand of Ephraim, and the tribes of Israel his companions; and I will put them with him together with the stick of Judah, and make them one stick, and they shall be one in My hand. And the sticks on which you write shall be in your hand before their eyes. And say to them: Thus says the Lord God: Behold, I will take the children of Israel from among the nations, where they have gone, and will gather them on every side, and bring them into their own land; and I will make them one nation in the land, upon the mountains of Israel, and one king shall be king to them all; and they shall be no more two nations, neither shall they be divided into two kingdoms any more at all. We are told that the two nations (Judah and Israel) will no longer be divided. The old divisions of north and south will be abolished and the nation will be united in God’s hand. No mention is made of two separate records or scrolls being joined together but of Ephraim and the other tribes of Israel joining Judah to become one nation. Ezekiel 37:15-7 does not refer to scrolls or books but to the eventual national unification of the children of Israel. Indeed, the claim of the Church of Jesus Christ of Latter-day Saints refutes its own contention in a very basic way. The passage in Ezekiel can not apply to the Book of Mormon which, insofar as it claims to be the record of Israelites allegedly concentrates on the descendants of a family of the tribe of Manasseh and is not inclusive of all the northern tribes. In particular, the Book of Mormon is not an historical record of the members of the Church of Jesus Christ of Latter-day Saints but the alleged historical record of the ancestors of the American Indians. All said, neither the Latter-day Saints as a group nor the people depicted in the Book of Mormon can fulfill the biblically explained prophecy. No amount of genetic testing or DNA sampling will show the Jewish people and the Latter-day Saints to be of the same ancestry. The Latter-day Saints are simply not of Israelite origins. The stick representing Judah and the stick representing the northern tribes of Israel become one when held end to end in the prophet’s hand. Thus, will the tribes of Israel that the sticks represent become one in actuality. Ezekiel 37:15-17 makes no reference to two separate records being kept, one for Judah and one for Joseph. Furthermore, there is no promise made of a national unification of Jews and Latter-day Saints taking place in North America or anywhere else. For all their assertions and genealogical research, the Latter-day Saints are not descendants of Joseph and can never join Judah in fulfillment of a nonexistent prophecy. The LDS Church takes many passages out of context and distorts the passage in Ezekiel and many other passages in the Bible to support their doctrine but Peter warned that ignorant and unstable people who distort the Scriptures do it to their own destruction, (2 Peter 3:16). My hope and prayer for the Latter-Day Saints is that they would renounce the false doctrine, false Christ and false prophets of the LDS Church and come to the Jesus of the Bible and be saved. Bodine ,Marian . "Witnessing Tips: Mormon Priesthood.” Christian Research Institute . 27 AUG . 2018 . <http://www.equip.org/article/witnessing-tips-mormon-priesthood/> . “Book of Mormon Problems.” MORMON THINK . 27 AUG . 2018 . <http://www.mormonthink.com/book-of-mormon-problems.htm> . Hinkley , Gordon B . “Interview Gordon B. Hinkley.” PBS . 27 Aug . 2018 < http://www.pbs.org/mormons/interviews/hinckley.html> . "History of Freemasonry.” Masonic Service Association of North America . 27 AUG . 2018 . <http://www.msana.com/historyfm.asp> . "how accurate is the joseph Smith translation (jst) of the bible?” weebly . 27 AUG . 2018 <https://accuracyofjst.weebly.com/> . “Lost Priesthood Authority.” The Cross Unveiled . 27 AUG . 2018 . <http://www.thecrossunveiled.com/priesthood-authority.html> . "Qorbanot: Sacrifices and Offerings.” Mechon Mamre . 27 AUG . 2018 . <https://www.mechon-mamre.org/jewfaq/qorbanot.htm> . “Statement on Freemasonry and Religion.” Masonic Service Association of North America . <http://www.msana.com/religion.asp> . "The Stick of Judah and the Stick of Joseph: Let’s Find Out!” Jews for Judaism . 27 AUG . 2018 . <https://jewsforjudaism.org/knowledge/articles/the-stick-of-judah-and-the-stick-of-joseph/>. Telushkin , Joseph . “The Jewish Temples: The First Temple - Solomon’s Temple.” Jewish Virtual Library . 27 AUG . 2018 . <https://www.jewishvirtuallibrary.org/the-first-temple-solomon-s-temple> .